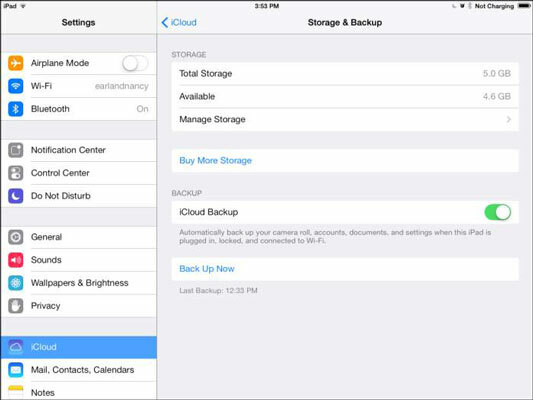 You used to be able to back up your iPad content only using iTunes, but with iCloud, you can back up via a Wi-Fi network to your iCloud storage. Note that whereas iTunes backs up everything, iCloud backs up only what Apple considers your most important content — Apple never backs up videos you get from sources other than iTunes, for example. You get 5GB of storage (not including iTunes-bought music, videos, apps, and electronic books or content pushed automatically among your Apple devices by iTunes Match) for free, or you can pay for increased levels of storage (10GB for $20 per year, 20GB for $40 per year, or 50GB for $100 per year). 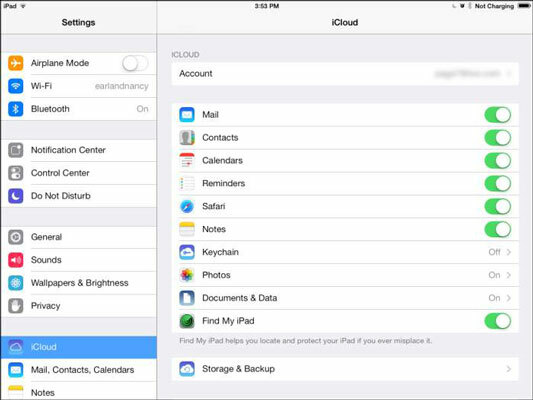 Set up an iCloud account and then tap Settings on the Home screen. Tap iCloud and then tap Storage & Backup (see the figure). In the pane that appears (see the figure), tap the iCloud Backup On/Off switch to enable automatic backups, or to perform a manual backup, tap Back Up Now. A progress bar shows how your backup is moving along. Automatic backups ensure your data is saved.